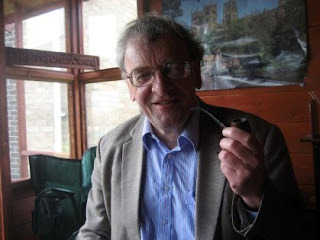 So the enigmatic columnist John North has finally shuffled off his mortal coil. Today his last column appears in The Northern Echo. Writer Mike Amos (above) is retiring JN before his own retirement in October. The column, described as "a quirky view of the region's people and places", has had many guises. When I joined the Echo in 1979 it was written by John Simkins who went off to the FT. He was replaced by Bill Hearld, later deputy editor of the Yorkshire Evening Press. Others included Stephen Brenkley, the Independent's cricket correspondent, and Terry Ramsey who became TV editor of the Standard. When John North was on holiday there was an occasional woman's perspective by Jane North. But the column mainly belonged to Mike, who celebrates 46 years at the paper this year. He relinquished it while he was the Echo's news-editor but came back to it as a weekly column years later. In its heyday the column was daily. It was a full-time job and the brief was to be out there picking up the interesting snippets, the oddities, the grassroots stories that were peculiar to the North-East. The JN chair in the office was always empty. It was also one of the most high pressure jobs in the business. Every day JN had to find fresh, compelling material and, unlike the national columnists, he was on his own. There was no team of researchers, no juniors or back-up staff. And Mike, who doesn't even drive, delivered day in day out. In these austere times there are few regional papers who can afford a full-time, off-diary writer. But there was no doubt JN brought in readers, gave the paper an essence and a unique voice. There are many reasons why regional newspapers are in decline but I am certain that one of them was the whole 'value for money', high story count policy peddled by the beancounters. Legs of briefs on car boot sales and choir rehearsals may be easy pickings but they are of no interest whatsoever to the general reader. What JN offered, and what all newspapers need, was a reason to buy the paper every day. So RIP JN, he will be missed. But I wouldn't be surprised if, somewhere down the line, he doesn't make a comeback. It may have slipped the radar in the current newspaper turmoil but the London-based Irish Post closed yesterday. It is always sad to see a newspaper go under, especially when you have a personal association with it, but I can't say I am really surprised. The Irish Post had been losing money and, with its parent company TCH facing its own economic challenges over the water in Cork, its closure has looked inevitable for some time. Perhaps the short life of the Post is an illustration of what is happening to many, longer-established titles. It started in 1970 as a voice for the Irish in Britain when emigration was at its height. It was the brainchild of journalist Brendán Mac Lua and for years provided the Irish communities, particularly in London, Birmingham, Manchester and Liverpool, with news from back home and in the UK. Its mission statement was 'If it's Irish in Britain, we've got it covered.' For years it ran the prestigious Irish Post Awards. But as the second and third generation Irish became absorbed and as the internet allowed instant access to news from home, it became less relevant. Distribution was also enormously difficult. In 2003 the paper was selling almost 32,000. When it closed yesterday it was about half that. In 40 years the paper's raison d'etre simply disappeared. Its audience changed and technology made it surplus to requirements. Sound familiar? It was a great institution though, a place full of characters. I first redesigned it in 1996, when Doug Baxter (now married to the actress Victoria Smurfit) was the chief executive and the late Donal Mooney was the editor. I then put in a consultant editor, Brian Page, while we helped to recruit a new full-time editor Norah Casey. In 2005 we redesigned it again. Last year I met the editor Mal Rogers, an award-winning travel writer, on the editor's chair course that I run for PA Training. We discussed the paper's strategy, its long term ambitions and the size of the task became clear. He was passionate about the Post and it is a real shame its closure came on his watch. I wish him and his team well. 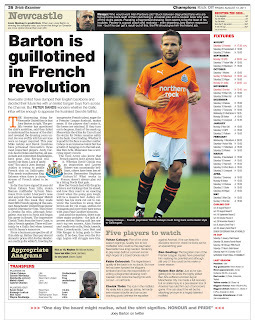 Here is the cover and my Newcastle United preview from the Irish Examiner's 40-page pre-season football supplement. 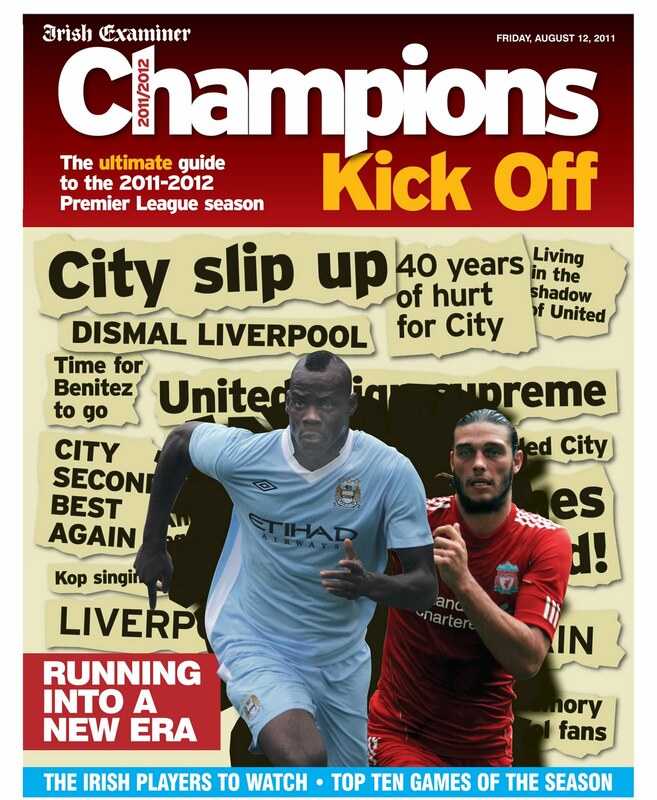 It was published last Friday and includes a page on each club, predictions, betting, analysis and some great writing from the likes of Ben Lyttleton, Adrian Clarke and Iain Spragg. I produced it while sunning myself on the family summer holiday on the Med. I was aided by Paul Wick and Mike Brough who are based in Darlington. It was printed and published in Cork. We have done this for years. 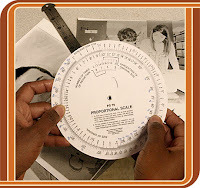 We receive a flatplan from the Examiner, they provide some of the material and we commission and write the rest. We then edit the copy, write the headlines, select the pictures, layout the pages, proof-read them and send them to Ireland. They email any changes, we carry them out and send them hi-res PDFs to put directly on their system. It works and it's cost effective. Three people producing a 40-page paper at a rate per page. In May the Full Time supplement we did in the same way was 56 pages. I have long advocated that this is how newspapers should be produced. Subs can work from anywhere - in their bedrooms or in the South of France (indeed, the Evening Herald in Dublin is produced entirely at Castres in the South of France). Subs don't all have to be in the same room, the same building, the same town or even the same country ... which is why all the fuss in regional newspapers about moving production sites from one city to another struck me as nonsense. In future I reckon all newspapers will be produced this way. Who needs complicated management systems? Bedroom subs armed with a computer, a set of stylesheets, the right fonts, broadband, a piece of software (doesn't matter if it's Quark or InDesign) and Distiller will be contracted to do so many pages per day to deadline. And where would you rather work ... in a pokey office in an industrial estate or in your own back garden or, perhaps, in the South of France. Is the 'hat up a tree' story real? This story has been doing the rounds on Twitter ... and looks like a very good addition to the growing collection of non-stories. But I have doubts whether or not it is real. First, nobody has said which paper it is from; second, why has it appeared now when the month mentioned in the story is April and third, not even the hardest pressed newsroom could really believe this is a story. I reckon it's probably a Framley Examiner-type spoof. 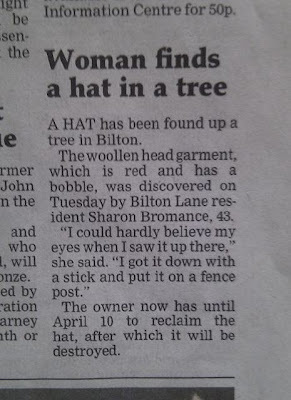 Even if it is, 'the woollen head garment which is red and has a bobble' is just genius. If anyone knows anything more, please tell. Update: @helenlewis has just Tweeted to say it's an April Fool. Makes sense (although not a very good one). 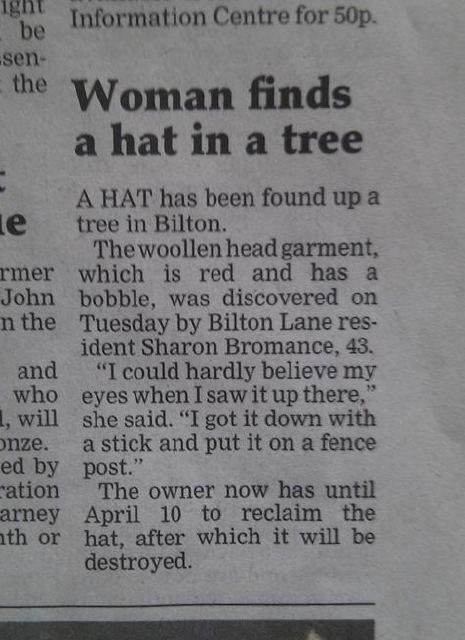 And @Findus_Dinner has pointed me in the direction of another lost hat story, this one is real and it's from the Norwich Evening News. He also draws attention to the slightly less wholesome 'man defecated on hedgeghog in street' story. Bizarre .. but doesn't really fit in the non-story category. Keep them coming.